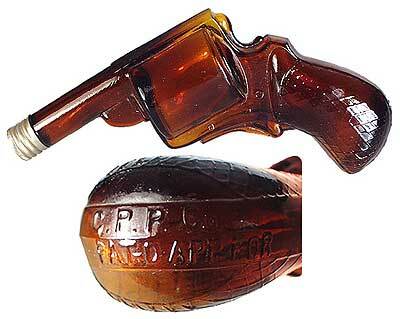 I see them on a lot of sale tables at the bottle shows and I have always wondered if these revolver shaped bottles originally held whiskey or candy. Has anyone ever seen one with an original whiskey label? Several years ago, I handled a clear example that had a paper label for a San Francisco saloon affixed to it. It was "compliments of" and I assumed that it was Christmas season give away for preferred regulars. I've seen several with Bay Rum labels from perfume companies. I have a large one (about 10" long) with a label that is marked "Buffalo Bill/Bay Rum/Standard Perfumery Works N.Y."
Rick - Dale is correct. 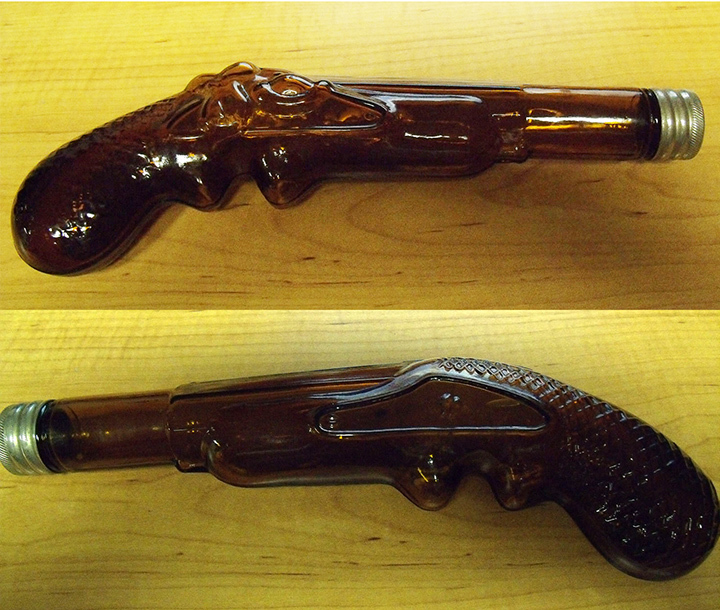 There is a western clear bottle in the shape of a pin-fire revolver, with an octagon barrel, a ground screw top and, that is embossed on the left side of the handle "Jack Hern / 561 Park Ave. / East Oakland, Cal". I do not know who Jack was or what was at that address but a little research into the business directories and newspapers of Oakland at the turn of the century might find Jack at that Park Ave. address selling, candy, liquor, or running a bar. - Charles F.
Jack Hern ran a saloon around Park & Railroad in East Oakland in 1912. Oregon's Rarest Blob Soda- H.D. Albany, O.